The Drop Strike Eject is the ultimate fusion of ground and air technology capable of driving, flying, and firing missiles. The all-new chassis release system detaches the wheelbase and unleashes a highly aggressive standalone helicopter. The Drop Strike Eject has dual missile bays that can be fired individually or in rapid succession. Transition from ground to sky in seconds and unleash a devastating payload of missiles on multiple targets. Includes: 1 Air Hogs Drop Strike, 1 IR Controller/Charger, 6 Missiles, 2 Targets, 1 User Instruction Guide. 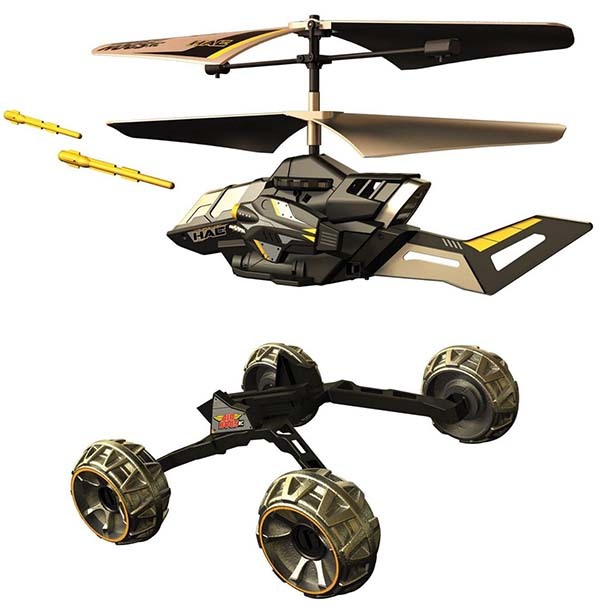 Engage in battle with the ultimate fusion of ground and air RC technology. The Air Hogs Drop Strike can drive, fly, fire projectiles and eject with the all-new chassis release system. The eject able wheelbase is deployable at the push of a button. Upon disconnecting, the Drop Strike takes on aggressive flight characteristics enabling evasive aerial maneuvering. With two adjustable missile bays, the Drop Strike delivers precision firing in both ground-attack and heli modes. Whether on land or in the sky, the Air Hogs Drop Strike is a devastating force to all who stand in its way.